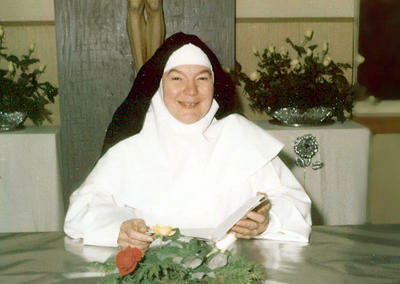 Mother Marie Rosaria at her Silver Jubilee in Summit (1969). Prioress. Foundress. "Renaissance Woman." These are some of the words which come to mind as we remember Mother Marie Rosaria of the Eucharist, O.P., former member of our community, and one of the foundresses of the Monastery of Our Lady of the Rosary, Cainta, Philippines. Mother Rosaria died on 28 August at the Cainta monastery, leaving behind a rich legacy and vision to her sisters there and here in Summit. Sr. Mary Catharine and I had the privilege of meeting Mother Rosaria when she returned here in 1994 for our 75th Anniversary. Although diminished in body and mind, Mother's determined spirit and sparkling personality were still very much in evidence. The Dominican Province of the Philippines has a touching tribute to Mother Rosaria on its website. We invite you read it (click here) and join us in thanking the Lord for her loving service and fidelity in living and promoting the Dominican life she cherished so well.